In New York City it is the most widely planted tree. It thrives in difficult urban conditions including drought, fog, frost, low sunlight levels and pollution. Its resistance to parasites, insects and pollution ensure it of an astonishing lifespan of a thousand years. The Chinese, with the reverence for the elderly, found that gingko could reverse memory loss in the elderly including its use daily in the way of teas and dishes made from the ripe gingko fruit. Ancient Japanese scholars protected their valuable papers from insects by placing the leaves between the pages. The coatings of the seeds have long been used as an insecticide. Modern science has proved that it contains a disinfectant called 2-hexenal which kills microbes, including the E.coli virus. Most touching of all, gingko seeds in the ground survived the Hiroshima blast to sprout from the ashes . The living gingko survives and marks the site of the explosion. Gingko biloba’s ability to scavenge free radicals gives us a means to counteract radiation we are exposed to be it as part of cancer treatment or from pollutants. Proof of this comes from the aftermath of the Chernobyl disaster when radiation spread across North Europe as far as Great Britain. Shown to be effective in combating the effects of radiation. Exposure to radiation causes cells to break down and gingko has been shown to be the most effective antidote to the breakdown of cells due to radiation. In the blood of people exposed to radiation we find substances known as clastogenic factors. These factors can break chromosomes and severely damage cells. Survivors of the Hiroshima and Nagasaki bombs and those workers that worked to clean up the Chernobyl nuclear plant all had clastogenic factors in their blood. Among the plant’s main constituents are gingkolides which are not known in any other plant species these are PAF (platelet activating factor) blockers. In other words it is as natural blood thinner and should not be used in conjunction with blood thinners like Warfarin, aspirin etc. 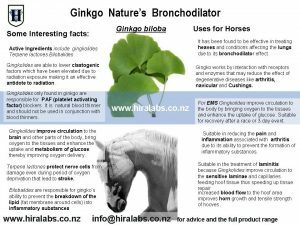 Gingkolides improve circulation to the brain and other parts of the body, bring oxygen to the tissues and enhance the uptake of glucose thereby helping metabolise glucose. Terpene lactones protect nerve cells from damage even during period of oxygen deprivation that lead to stroke. Bilobalides account for gingko’s ability to improve memory and promote recovery from stroke. Gingko works by interaction with receptors and enzymes that may reduce the effect of degenerative diseases and aging. A recent study has found it to be a natural bronchodilator and effective in treating asthma in children. Gingko extract improved the mental performance in geriatric patients where this was impaired. One of the main features is gingko’s ability to prevent the breakdown of the lipid (fat membrane around cells) into inflammatory substances. A tea can be made from the leaves but it is quite unpalatable taken this way. A few drops of extract taken daily in a smoothie may be more preferable. Gingko extract may be taken on the morning of an exam to improve memory recall. Gingko tea or extract is particularly suitable for the elderly and may help protect the brain from degeneration. Caution: Gingko must not be taken in conjunction with blood thinners or prior to surgery. Exceeding the recommended dose may lead to nose bleeds and bruising. 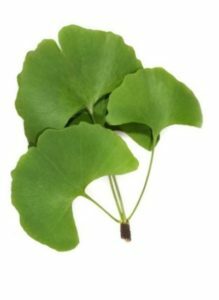 For the treatment of idiopathathic vestibular disease found more commonly in dogs where the inner ear mechanism is affected to the point that the dog loses all sense of balance, ginkgo is the herb of choice. It is also known as Nature’s Vivitonin. Gingko lends itself to a number of treatments. Popular in town house sections in Europe is the use of densely clipped Gingkos in large pots. These trees may be trained with a single trunk and a rounded top. Clip late summer and keep the leaves for teas. Disclaimer: Information in this article is not to be used in place of professional medical advice and expertise. For diagnosis and treatment always see your health professional.